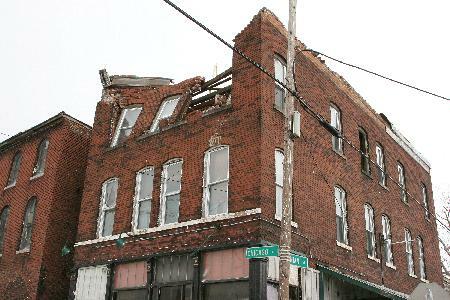 The city has ordered the emergency demolition of a historic building in the Old First Ward, claiming the owner has failed to correct safety hazards. 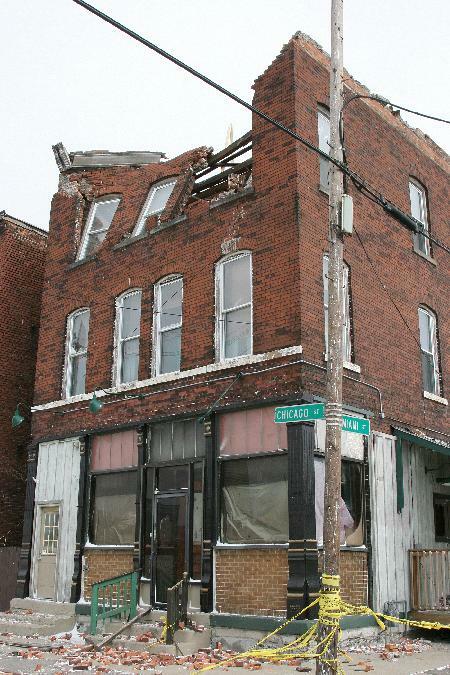 Weather permitting, crews will start tearing down the former McBride�s Irish Pub Monday, Buffalo�s inspections chief said. 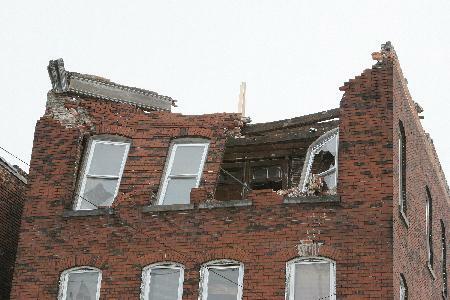 The structure at 115 Chicago St. was damaged in two January storms. 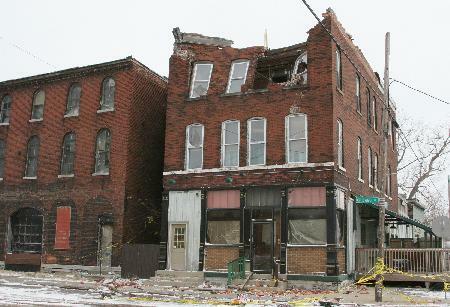 Powerful wind gusts ripped off the roof and later caused a section near the front of the building to collapse. The city closed Chicago Street between Ohio and Miami streets to prevent vehicles or pedestrians from being struck by debris. 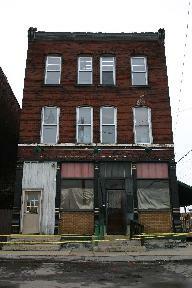 City officials gave building owner William J. Crawford �ample time� to address hazards of the structure that was once a well-known hotel, Erie Canal tavern and speakeasy, insisted Permits and Inspections Commissioner Richard M. Tobe. �He gave us no choice,� Tobe said in defending the city�s demolition order. 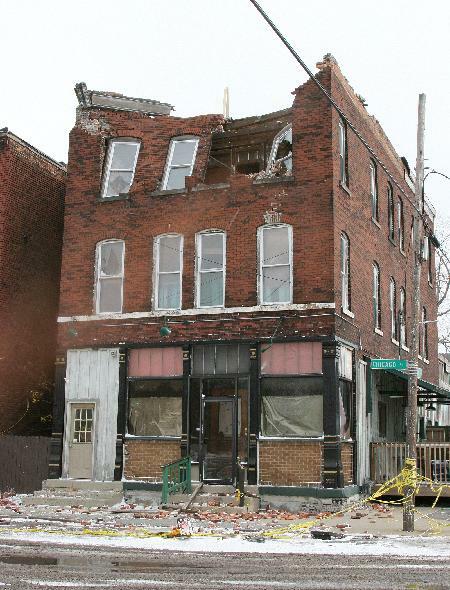 �The building is in bad condition and deteriorating very rapidly. It�s completely exposed to the elements.� Tobe said city officials had great difficulty in recent weeks contacting Crawford to discuss the building�s status. Crawford could not be reached to comment. The head of a preservation group that was working with Crawford said efforts to find renovation money proved fruitless. �It breaks my heart that it may come down, but it�s a difficult circumstance,� said Timothy Tielman, executive director of the Campaign for Greater Buffalo. Some had earlier thought that the now-vacant three-story building might have been the place where the Fenian invasion of Canada was planned in 1866. But Tielman said preservationists recently concluded the building was probably built a couple of decades after the invasion. Still, Tielman said, the structure and its site are historically significant. �The Old First Ward is losing a lot of its cultural and architectural heritage,� he said. Tielman claimed land acquisitions tied to the casino project are making it tough to preserve historic structures in the Old First Ward. �It�s no secret the Senecas have been going door-to-door to see if people want to sell,� he said. McBride�s Pub, located at 115 Chicago Street, in Buffalo�s First Ward, ranks as one of the most famous sites in the history of the Irish in Buffalo. The three-story former hotel, Erie Canal tavern and speakeasy is the place where two vastly different events were planned: The Fenian invasion of Canada in 1866 and the first local St. Patrick�s Day parade in 1913. McBride�s, one of only two remaining Erie Canal-era taverns, has had a spirited history. The building, a few blocks east of HSBC Arena and just south of South Park Avenue, dates back to roughly the 1850s. In 1866, the German hotel at that site housed the planning meetings for the invasion of nearby Canada, at the Battle of Ridgeway. The Fenians, mostly Irish veterans of the American Civil War, invaded Ontario from Buffalo on June 1, 1866, as part of a plan to hold Canada hostage until England freed Ireland. While the invading army was defeated, the battle was considered a turning point in Canadian history: The Fenian raids convinced Canadian leaders that Britain couldn�t be trusted to defend Canada. One year later, confederation brought national government to Canada. A more spirited annual tradition also can be traced to the three-story structure at 115 Chicago St. By 1913, the building was known as Quinn�s Pub. A Sunday meeting involving proprietor Mike Quinn and the men of St. Brigid�s Catholic Church led the proud Irishmen of the city to decide to pay tribute to St. Patrick with a march through the streets on the 17th of March. In subfreezing temperatures, 5,000 marchers led by the grand marshal � Quinn � walked through the streets, starting and ending at the Elk Street Market Terminal. The event, historians have noted, served notice that the Irish-Americans would be a huge force in Buffalo�s political, business and professional circles. Thus was born Buffalo�s still-celebrated St. Patrick�s Day parade. 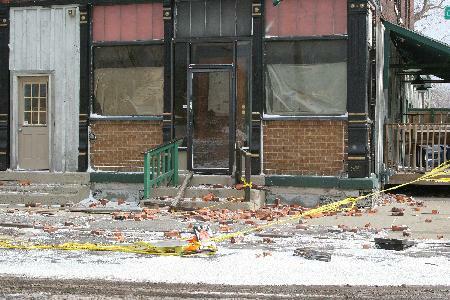 On Jan. 10, 2008 a strong wind storm blew the roof off McBrides. Owner hopes to move structure to Erie Canal site.